Editor' s Note: An expanded collection of Stump' s work is showing from July 11 to 16 at American Traders, 257 Marlboro Rd. (Rte. 9), West Brattleboro, (802) 254-1300. Meet the artist at a Barbecue & Gallery Walk Reception from 4 to 8 on July 11. A changing selection of work by Stump is available year-round. Robert Stump, a self-schooled artist with a love for the natural world, is currently producing a variety of original works in a number of different mediums. 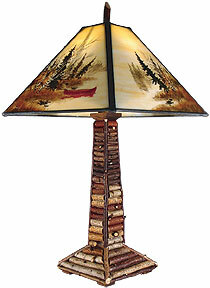 Included are hand-painted glass lamps and lighting, original watercolors, and paintings in acrylic and oils. His studio also publishes fine art giclée prints from the original paintings. The diversity of this work is made possible by combining wood, paint, glass, metal, ceramics, forest materials and years of dedication to several time-honored traditions. Known in some parts of the country as "The Adirondack Artist," Robert draws much of the inspiration for his work from traveling through many of the country' s state and national parks. The natural beauty of North America is a never-ending source of inspiration to him. Robert is also dedicated to a musical endeavor that he affectionately calls The Americana Project -- "I play country, bluegrass, swing, blues, acoustic. I've been writing a lot of songs about vanishing America." The largest works in the exhibit are two chandeliers made with hand-painted, kiln-fired stained glass. The paint, after being fired in the kiln, fuses with the glass to create a soothing effect. Robert has invented ways to manipulate and enhance the glass in the kiln. 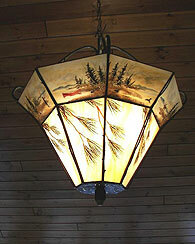 A combination of paint, glass powders, and frits are fused onto stained glass to achieve special effects and details. The use of copper and natural birch or hickory saplings as a design element enhances the finished pieces and captures the classic Adirondack motif. Wildlife and remote landscapes are a predominant theme in Robert's work. 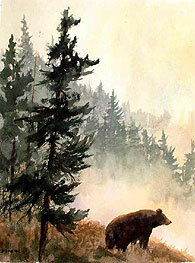 "Misty Island" and "Lookout Bear" capture those ethereal moments after daybreak when the mist is rising off the water. "Cabin on the Falls" and "Red Canoe" reflect on the peace and quiet of what hopefully will be "Forever Wild." The natural color of hickory, birch, and other forest materials are selected to frame and complement the paintings. American Traders specializes in classic handcrafted wooden canoes, toboggans and sleds. They also sell sturdy indoor and outdoor furniture and accessories by North American artisans; blankets and winter clothing; and many other useful and decorative items from axes and snowshoes to fine art and more.